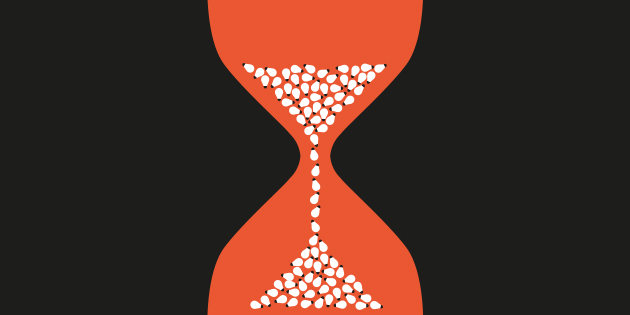 Does a time limit make you more creative? 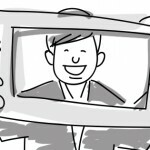 Home » Does a time limit make you more creative? A strict time limit can both stimulate ánd kill creativity. Knowing why will help you to get better results in less time. Time is money, so managers tend to allocate as little time as possible for creative thinking. Presumably, they think that coming up with original ideas is not that hard anyway and that employees should get back to their principal tasks as soon as possible. While a very narrow time frame for creative thinking might seem like it saves you time, I’d like to argue that the opposite is true. Leaving too little time for creative thinking will actually cost you a lot of time in the long run. Frankly, rushing the creative process is a waste of time. Here is why; if you allocate a very short period of time for generating ideas, after which you rush into implementation, you will end up implementing obvious, boring ideas. As ad agency Café Communications showed in their famous video on the link between creativity and time, giving people too little time will leave you with the first ideas they’ll come up with. The first suggestions people come up with are the logical, ‘reasonable’ ideas that any sane person will think of. Ideas that make perfect sense and that will probably be described as ‘good’ and ‘satisfactory’. Most people don’t bother looking for alternatives after they’ve found these sensible ideas. Why would they? Well… because these first ‘logical’ ideas are not good enough. Pursuing these sub-par ideas will not lead to your much-desired progress. Eventually, you will find that what you settled for is not such a good idea after all. A competitor rocks your world with a remarkable new product, your new approach is not interesting enough to capture any attention or… the approach turns out to have very little impact. Long story short; you will have to start all over again. All you have done is waste precious time implementing an idea that wasn’t good enough. To find ideas that are worthwhile, you’ll have to try a little harder. But these ideas are certainly not out of your reach. For beyond the obvious ‘logical’ ideas lies a world filled with unusual, bizarre and brilliant ideas. Giving people too strict of a deadline will keep them from finding these unusual ideas. 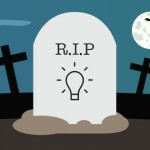 Original ideas are buried deeper than obvious ones and therefore will take a little longer to find. But given enough time, anyone can unlock these ingenious thoughts. So should we then clear schedules for days or weeks, for the mere purpose of generating ideas? Absolutely not. While too little thinking time inhibits creativity, too much time is equally harmful. Anyone who’s ever been in one of our thinking sessions will tell you that we are very strict when it comes to time limits. Participants in our think tanks will get very tight time frames for each thinking round. This is not because bullying participants is some despicable hobby of ours (though many first-timers might feel it that way). We actually have very good reasons for pressuring people. While nobody likes to be rushed (especially when trying to solve an urgent problem), it is important to get the best results. If people are given lots of time to think, they will do exactly that. They will think …and think …and think. But we don’t want participants to merely think. We want them to write down their ideas! We want as many ideas as possible. This goal is incompatible with a group of ceiling-staring ponderers. Giving people lots of time to come up with ideas will lead to them over-thinking things. Just imagine; you’re trying to come up with a brilliant solution for a tricky problem. You think of an approach that sounds interesting. However, when you consider it for just one more minute you realise that it is in fact, a rather poor idea. Implementing the idea is virtually impossible; a similar approach has been tried in the past, the managing director is notoriously sceptical about these types of actions and you’re pretty sure there are laws that will prevent you from taking the necessary steps. You discard the idea and start thinking about a better alternative. Sounds familiar? Of course it does. It’s how our brain works. Our mind is filled with idea killers that’ll snuff out anything that doesn’t sound logical right away. We’re not used to working with imperfect ideas …let alone completely unrealistic ones. We want logical solutions. …absolutely everybody could come up with. If you want truly original ideas, it’s imperative to work with imperfect suggestions. Use them as stepping stones. Utilise crazy ideas as inspiration to get to viable actions. Therefore it is very important to write down every idea that pops into your head. Not just the logical ones, but also ideas that might be a bit weird. And the best way to make people write down anything is giving them a tight deadline paired with an idea quota. If people know they’re expected to come up with a certain number of ideas in a very short period of time, they will write down every idea that strikes them. Take away the luxury of time. Removing any excess time to over-think things will lead to more ideas. More ideas will hugely increase your chances of finding unusual, unexpected and possibly absolutely brilliant ideas. After all, in creative thinking quantity leads to quality. So, how do I use this to get better results? If your organisation is faced with an urgent and difficult challenge, don’t expect your people to solve it in a rushed half-hour. But don’t give them seas of unrestrained thinking time either! Make time for creative thinking, use some relevant thinking techniques and use short thinking rounds with clear time frames to generate more ideas in less time! If you enjoyed reading this article, feel free to share it with your network by hitting the Tweet, Like, Share or Google+ button. This way the people in your network can benefit from this post as well. Flickr Creative Commons Image via mao_lini. Receive our biweekly email with our latest articles on business creativity. René is one of the founders of HatRabbits. His background in both law and photography enables him to shift smoothly between very different worlds and might explain his fascination with unusual combinations. What if… a simple question could spark your creativity? 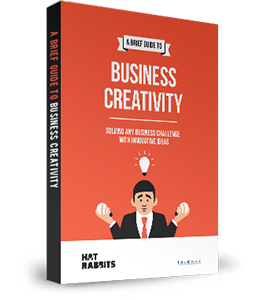 Sign up now and receive a free ebook on Business Creativity.